Eat healthy this march Spinach, Kal, Cabbage, Asparagus, Lettuce etc are an important part of a healthy diet share healthy recipes of leafy green vegetables to win a Bigbasket Gift card worth Rs 500 Submit your recipes here. 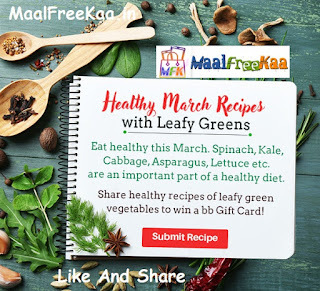 Submissions filled in full are highly preferred for the contest Share Leafy Green Recipes and Get Rewarded Submit Your Leafy Green Healthy Recipe To Win Free. The image must be of the cooked dish at a 45 degree angle. The image must be in focus, well lit and photographed with realistic colour. It has to be a high resolution image with at least 150dpi (High Quality Image). The full dish must be in frame. Recipe Contests run for a week (Thursdays to Wednesdays) if not mentioned otherwise. All recipes received and published on the bigbasket recipes channel shall be an exclusive property of bigbasket.com. The recipes will be published with the chef's image for a period of one month from the recipe publish date. bigbasket.com is not legally liable for duplication or infringement of copyrights by a user for any user-generated recipe and cannot be held responsible in any circumstance.